With a little bit of work, you can get good compositions in your underwater photography. Very good compositions, however, can be very difficult. No matter if you are using a compact camera or a dSLR, sometimes the slightest movement of the camera can throw off a composition. Such is the case for a composition like this 3-inch long Coralline Sculpin, taken at Santa Cruz island in the northern Channel Islands. There are several things you should notice about the composition in this photo. One, it is taken from very low - I had to get an angle slightly under the fish, which was very difficult to do. Also, this fish is a darter, so at most you get one shot before the fish moves again, so you have to be ready. Two, I have almost the entire fish in the frame. This is the most difficult part, because the slightest movement of the camera will throw off the composition, resulting either in too much of a "head on" shot, or cutting off too much of the fish. Three, there is some space to the right of the fish, which is called "giving the fish room to swim". You don't want the face of the fish too close to the edge of the photograph. So take your time thinking about the composition you want, but don't hesitate to quickly press the shutter if your subject is a "darter". With some practice, you'll start to get some keepers. 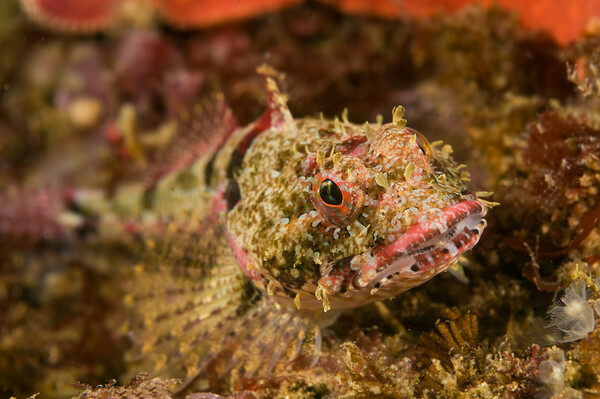 Dealing with taking Underwater photos of "Darters"
Do not chase them around, don't try to approach them from above. Watch where they go, move far away, get low, and slowly approach them, staying low. It can very hard to get the correct angle of approach and composition after they have "darted" to a new position, so back far away, find the right angle, and re-approach slowly. Submitted by Anonymous on Wed, 2010-03-10 18:39. Good point about the "darters". I had this experience with a little sculpin at Santa Cruz the other day, too, where I'd compose the shot all nice, then the little fish would dart away from the camera right as I was pressing the shutter - fooey! Gotta be QUICK if you want keepers (hope to master that someday).